It’s official: fall is here! Running promos during this in-between season can be as overwhelming as trying to dress for it (one day it’s hoody weather, the next it’s tee weather). When you’re thinking about promos, you have to turn on your marketing brain and think ahead. And there are lots of ways you can get your Shop ready for scoring some earnings this season while also preparing your Shop for an awesome holiday season, too (which is creeping up fast). Time to jump into 1: a pile of leaves and 2: fall promos – here are a few stellar ways you can get your Shop fall-ready! Running a giveaway* is more than just a solid way to attract more customers to your Shop and increase your social following. If you start building your follower lists, your email list, hype for your Shop, and more this early on, you’re setting yourself up for a larger audience during the holiday season early in the game. So take advantage of the $10 gift codes we’ve been sending out to Shop owners every week and host some amazing giveaways. *Every social platform has strict rules when it comes to running giveaways. We touch on a few basic rules in our giveaway blog post, but be thorough and read up on all the rules for each platform to save yourself a run-in with the Internet police. This July, I went to Michaels Arts & Crafts to buy frames only to be greeted by a WALL of pumpkin spice & fall-themed everything. In July. Much like Christmas, Halloween & fall hype is starting earlier and earlier each year. A Halloween sale – especially if you have lots of creepy, Halloween-y designs – is a great themed sale you can run this fall while people are in the spirit of spirits. But start early! In 2015, PR Newswire reported that 66% of U.S. adults (18+) shopping for Halloween started before or in early October. And the closer you get to October 31st, the lower the percentage of these shoppers, with just 10% shopping a few days before, 2% the day before, and 1% on the actual date of Halloween. Tl;dr: if you want to jump on the Halloween vibes and rack up some sales on creepy designs, start now! Pro tip: Use Inktober as a way to regularly create new creepy content for both social and for your Shop. Left: an image that’s full of warm weather summer vibes. | Right: A photo a little better suited to fall & fall sales. Look at the above photos – even with similar color schemes, which says “fall vibes” more to you? Lifestyle photos are meant to sell just that – a lifestyle and an experience, not just products. Fall is all about creating a cozy atmosphere; reflect this in your photos on your Shop’s homepage collection, on social, in your ads, etc. Shoot lifestyle photos full of fall-ish colors and featuring fall-relevant products in locations that bring to mind pumpkin carving, apple picking, and warming up with a latte. 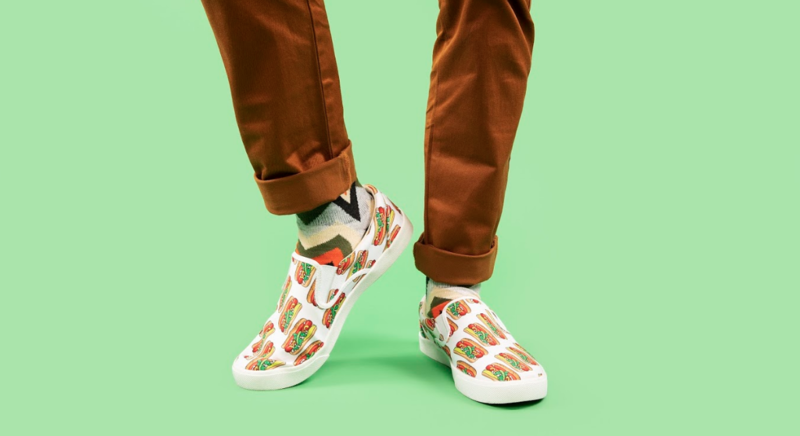 Put together fall outfits that customers can see themselves wearing from head to toe, like Bucketfeet slip-on shoes styled with a funky pair of socks and paired with a fall mug and pullover sweatshirt for a full look. Pairing a pair of slip-ons – which have a spring/summer vibe to them – with a fun pair of socks and a pair of pants with a fall color & style is a perfect way to bring this product into the new season. Order samples of your own items at the base cost and with free shipping (on orders over $25 US, $50 INTL, excludes INTL wall art & INTL shoes) and start capturing some content that will really sell your fall & chilly weather products! Want some photos to feature in the meantime? Try out Placeit, or try using the stock images we provide. This may seem like a given, but make sure you have fall-related items in your Artist Shop! This isn’t the prime time of year to highlight beach towels and muscle tanks in your promotional posts. Fleece blankets, the newest super soft sponge fleece sweatshirts and hoodies, and mugs, for example, are all staples of the season. Make sure that you’re featuring these products and more cozy items on your Artist Shop’s homepage collection. *If you already have phones added to your Artist Shop, the new cases have already been added to your phone case lineup. Sales are a great way to drive people to your Artist Shop – after all, who doesn’t love a good sale? The season of in-between weather is the perfect time to sell transitional items like pullover sweatshirts and zip-up hoodies. Get clever with how you frame your fall sales. Celebrate weird, random holidays, or look at the Threadless Ziptember sale as an example. Trying running your own version of Ziptember (with your own clever sale name, of course) – put your fall products and soft fleece on sale in honor of fall, or put a different fall product on sale every day as a new daily promoted product. Don’t miss out on your chance to take advantage of the season! Previous post T-Shirt Guide: What Sets Apart the Different Styles of T-Shirts in Artist Shops?